Does anyone have a ST:AW template? I'm looking to make extra custom stats, but can't find online any ready-to-roll templates. Have you tried BoardGameGeek? there's tons of files there. any chance you'd know the font style? and a re-imagined decent Borg Queen Captain/Admiral. I don't want to tread on their awesome statcard toes, if they've already made pure awesome! Have you seen the recent large "bork Cylinder" on Shapeways? They're also making a 1:5000 borg freighter from ENT and the VGER cloud (at 1:11400). I believe there is actually more than one special font required by the various templates contained there. However, to my knowledge, the fonts are included in the zip archives when needed. ex. Swiss 911 Ultra Compressed (the primary font) comes with the Ship-Upgrade, and Mission Template Master Bleed archives. I too think you Borg Tet is awesome. As well as your other creations. Good job! Keep it up, and please keep us in the loop. ~Assimilate two worlds and PM me in the morning. Also, here is a link to a relatively maintained Google Docs spreadsheet containing details AND links to many custom cards already created by our community. and extra special thanks for those handy custom cards and tech! They're surprisingly well balanced, and I'm liking Err404's work muchly. why should the bigger scales have all the fun? 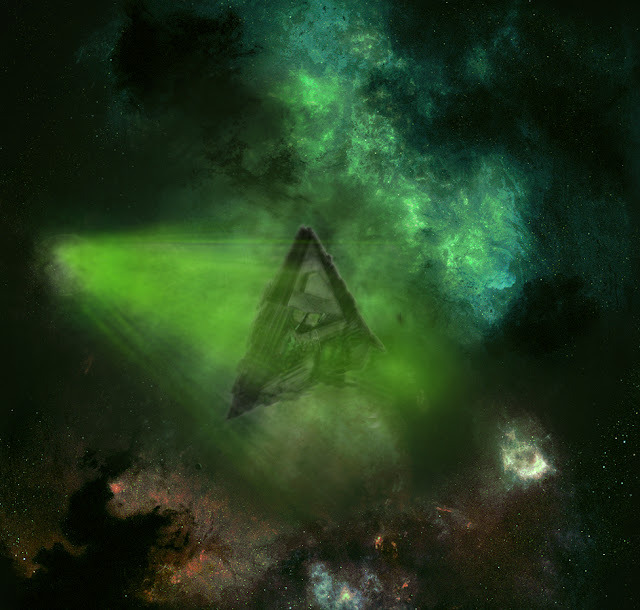 Above: Nebula background is a heavy remix modified from "Spectral Scent" by aRchAng3lZz of devart, under CCA 3. Visit aRchAng3lZz and support them so as they can keep making space stuff! how do folks better depthmerge the foreground to the background? could the transwarp effect be made different? - I think I've put too much yellow and white into the effect, and not enough dark green or distortion. That looks fantastic! The tetrahedron is a cool looking ship. what do you think of the green though? Also, how did you remove the edge lighting on your composite ship image? the Tetrahedron was a great idea, I've been meaning to thank Paul for suggesting that. Yeah, probably a little too much yellow/white on the transwarp blur. But it looks alright. Like a bright trail of green light. Hellfire might be an appropriate word, since this is a Borg ship. If you made the trail a little darker as it goes back into infinity, that might help. As-is it looks a little flat and unconvincing, but only if you look close. I'm still developing a technique but what I have been doing is pretty simple. I removed the backgrounds around Anzac in two passes. The first is just a rough pass to get rid of most of it. GIMP has a tool that allows you to delete things of a similar colour; it's rather indiscriminate, but useful. I use it to delete as much of the background as I can but without deleting any part of the starship. This seems to take a few tries to get right... kind of like whatshisname and his idiotic plan to destroy history in order to fix the timeline. What that tool doesn't get rid of I take care of by selecting and deleting it manually. On the second pass I get in close and use the paintbrush (small and circular) and freeform select tools to get rid of everything else and make sure the outline has a clean edge to it. I have found that shading the outline of the starship seems to help it blend into the new background a little better. The idea is to darken and blur just the very edge without giving it a cartoonish black outline. There is a bit of colour correction involved, too, using the paintbrush tool and careful colour selection. That's all there is to it, really. Sorry I can't be much more help than this; I'm still learning, too.